The PMD-2201 is a web-based intelligent Power Meter Concentrator. It offers webpage interface, and features various functions such as: power data collection, logic control, power demand management, data logger, local display/Web page data display and alarm notification functions. PMD-2201 allows connections to PM Series Smart Power Meters via RS-485 or Ethernet interface to read the power data of the devices measured by the power meters; and then real-time record the power values in the data logger file. PMD-2201 also provides data logger file auto send-back function; together with PMC Data Server software or SCADA software, it allows collection and analysis of the power data. PMD-2201 is equipped with the 7" TFT LCD (with Touch Panel) and designed for panel mount installation. It provides an easy way for viewing the power data and setting the system parameters at the local side. In addition, PMD-2201 also is equipped with built-in Web Server that allows direct connections via browsers to the PMD-2201 for viewing power data and setting up the system parameters. 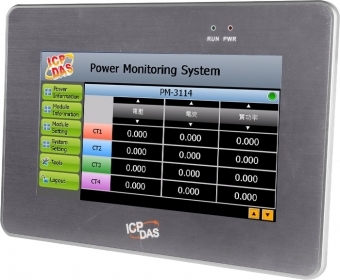 PMD-2201 also offers Modbus TCP/RTU Slave function that allows SCADA software to connect to PMD-2201 to get real-time power data of the devices via Modbus TCP/RTU protocol. In addition to M-7000 series I/O modules, the PMD-2201 could connect to standard Modbus TCP/RTU Slave modules. By working with the I/O modules, and functions such as IF-THEN-ELSE logic rule execution and alarm notification functions including Email/ SMS/SNMP Trap, PMD-2201 offers more thought-out power demand management and alarm notification functions, and is able to perform load shedding of the devices if required, and enables real-time monitoring and control of the power consumption of the devices. When using PMD-2201 to build a power management and monitoring system, during the whole process of system development, no programming is required; it takes a few clicks on web page to complete all settings; it is easy for the user to quickly view the power data of the devices and furthermore process the data for statistics and analysis. The PMD-2201 is an easy-to-use and easy-to-build total solution for power management and monitoring that makes more efficient energy usage. Allows connection of up to 8 remote Modbus I/O modules. (Modbus RTU or Modbus TCP) Allows connection of up to 8 remote Modbus I/O modules.